On July 28, 1864, the Union Army of the Tennessee reached a point west of Atlanta from where they could threaten the Macon Railroad, which entered Atlanta from the southwest. In an effort to thwart that move, Confederate General John Bell Hood dispatched his old corps, now under command of S. D. Lee, and A. P. Stewart’s Corps to blunt the Union advance. 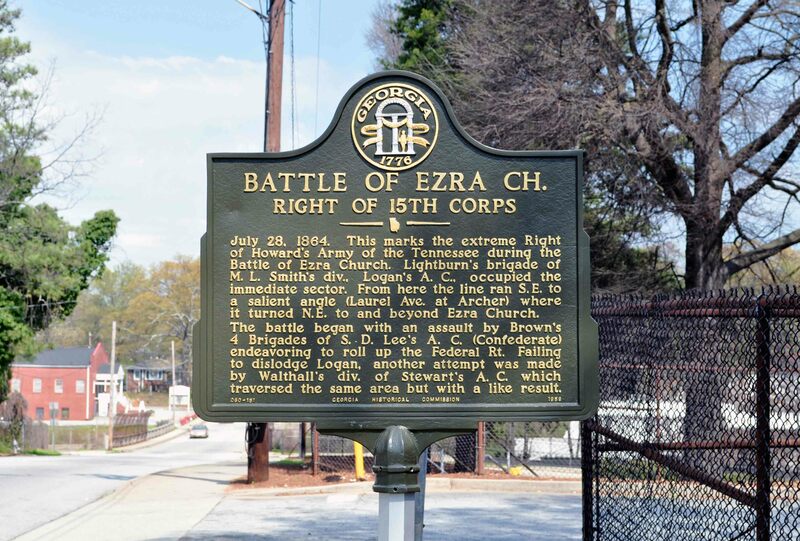 Lee decided to attack, trying to hammer the Union XV Corps and regain control of the critical intersection near Ezra Chapel. The battle was famously one-sided, resulting in about 3,000 Confederate losses to 642 Federal casualties. For Hood’s army, this was their third major assault in just over a week, a sequence of combat begun on July 20 at Peachtree Creek, continued on July 22 east of the city in what has become known as the Battle of Atlanta, and ended here at the chapel. Hood’s army suffered more than 13,000 casualties over the course of those bloody eight days. 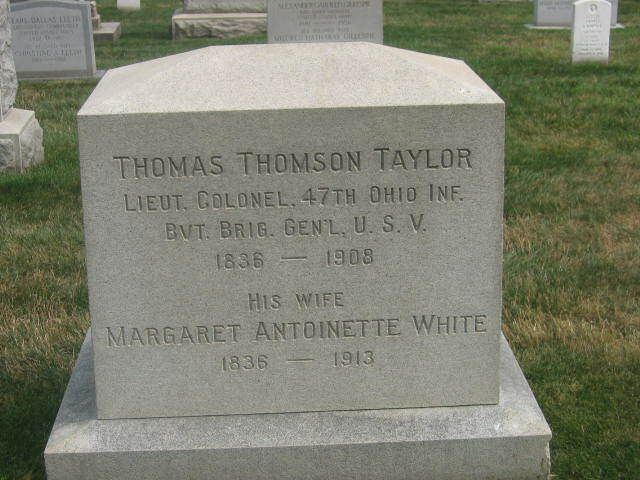 Lieutenant Colonel Thomas T. Taylor commanded the 47th Ohio of Lightburn’s Brigade, Martin L. Smith’s Division, on the extreme right of the Union line, at the point where S. D. Lee hoped to turn the Union flank. But as Taylor’s detailed diary shows, the battle was not entirely a Federal cakewalk. Thursday 28 July. Woke up — “Fell in & took arms” After time orders to stack arms & rest, and remained until sunrise. After marching, flanking, and countermarching at 9 a.m. we arrived upon a ridge next [to] one occupied by the enemy & formed line. Anon maj. Gen. Howard rode up and said we must have the other hill. Gen’l Lightburn came and asked me if I would take my regiment [47th Ohio] numbering 150 men and take the hill. I could have taken the hill, but what then? I merely asked what would support my left? He said, ‘Oh, form by the fence.’ I said nothing – presently he said ‘perhaps you are not strong enough.’ – he went to 53rd O[hio] and asked the same question. I was then sent forward to support the left & deployed two companies on the left of the road and my main body by the flank down the road until I joined Col. Jones [53rd Ohio.] When the right being hard pressed I was ordered to move to the right, did so and crossed a cornfield and took post near the intersection of country roads. In this advance we drove the enemy from the ridge into the woods beyond. After a time we discovered the enemy forming in the woods & moving to the right and presently a column charged by the flank across the field to an old cabin. This threatened the left and I moved back a few rods, halted and after firing heavily for a time advanced by the front, moving obliquely to the left to connect with 53rd Ohio. Then [I] deployed the regiment and to[ok] cover behind fence. About 11 a.m. the enemy again moved to the right and I sent word to Gen’l [Martin L.] Smith; in about half an hour they advanced in line of battle to the open field and few yards within when they moved by the flank and advanced within a few rods of us and threatened our left with a column moving rapidly down a ravine. 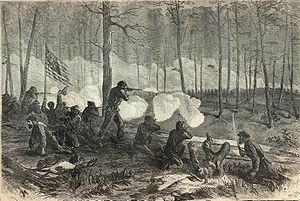 We fell back to the woods & I halted the regiment [at] its skirt and commenced firing, when I found that we were about to be taken as already both the 53rd and 47th were cut in two – thoswe on the left of the road succeeded in reaching our main [line] while we who were on the right were compelled to push to the right and came up by an old house and a few cabins, in front of which the enemy soon made his appearance. We rallied the skirmish[ers] to the best of our ability but as cavalry had been let loose upon us it was all confused & mingled in the retreat and hence [we] were in no condition to withstand a determined charge yet we did not retire until after a spirited resistance. We then slowly retreated over the hill & down its slope. Here we halted and rested. In a few minutes we again advanced. Only a few dauntless spirits, however, as [most of] the men could hardly be driven up. But finally we gained the crest and found the rebels retreating. A big shout and three hearty cheers brought the others up and with them we poured a heavy fire into the rebels which sent them back in the ravine. I got a color bearer of the 53rd O & one 54th Ohio & ran to a rail work and implored the men to come up, but the fire was so heavy none could, & on account of a flank fire we were compelled to retire. After a time we organized our regiments and under orders of Col. Jones 53rd O. moved into position. Our position could not be excelled and although we had many & large gaps in our line, they were all covered by crossfire. Four times the enemy assaulted our lines, yet without works we repulsed them each time with great slaughter. at 3 & 1/4 p.m. 47 O. were releived by the 81st Ohio — our guns were so foul they could scarcely be loaded. After loading many were cleaned by urinating & pouring water into them and shooting it out. William Webber was wounded while loading his piece the great heat exploding the charge & driving the rammer into his hands. I barely escaped capture with a portion of the regt. Cavalry charged our right & made it a close race to beat them to the woods. While it was with the greatest difficulty that [we] crossed a ravine to our own rear. In Div. front found 300 [enemy] dead. The typescript of this diary is at Emory University; Albert Castel also published a version of the letters and this diary in 2000. I found Taylor’s account striking – the details of the combat, the movements back and forth, the mention of a Confederate cavalry charge, and of the cleaning of the fouled muskets all create a vivid impression of the action. This entry was posted in Armies, Battles, Campaigns, Common Soldier, Emerging Civil War, Leadership--Federal, Personalities, Primary Sources, Weapons, Western Theater and tagged 47th Ohio Infantry, Atlanta Campaign, Battle of Ezra Church, Lightburn's Brigade, Martin L. Smith, Thomas Taylor. Bookmark the permalink. Thank you David. Vivid writing.